Entrepreneurship graduate Brooks Bassler (’02) has put his degree to work with a successful chain of “Tex-Orleans” restaurants called BB’s Café. Bassler, shown here inside his location in the Heights, is part of a family of proud UH alumni. Brooks Bassler’s father attended the University of Houston on a football scholarship and later started successful businesses in the housing, motel and energy industries. His mother grew up in Morgan City, La., in a family that knew how to stir up a good pot of gumbo. 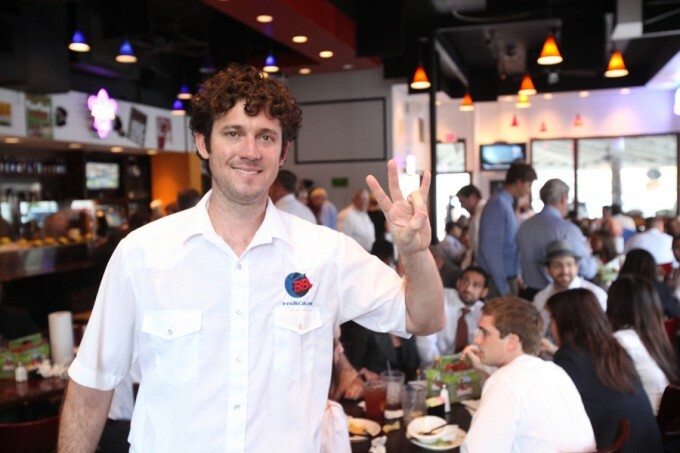 With his Maw Maw’s recipes, his Daddy’s business savvy and his degree from the Wolff Center for Entrepreneurship at the C. T. Bauer College of Business at the University of Houston, Bassler has built a bustling restaurant chain with three Houston locations. After finishing Bauer’s entrepreneurship program in 2002, Bassler worked as a server and learned the ropes of sales and corporate catering before creating his own casual Cajun brand in 2007. We recently checked in with the brains behind BB’s Café, who gave us the skinny on his family’s UH connections and how he used his Bauer education to carve his niche in the food world. Where are you and your family from exactly? I’m from a little town in central Texas, Rockdale. It’s a little small town of about 4,000 people. I was born and raised there. Most of my family is from Louisiana. My mom was born and raised in Morgan City, and all her brothers are there, and my grandma. … Every time we’d go there, the whole trip was kind of centered around food, what we were cooking next for breakfast, lunch or dinner. L. Miller Bassler. BS, Education, 1975. President and CEO, Bassler Energy Services. Brooks Bassler. BBA, Entrepreneurship, 2002. Owner of BB’s Café and BB’s Catering. Briana Bassler. BA, journalism and political science, 2004. JD, University of Houston Law Center, 2007. Associate at Schirrmeister Diaz-Arrastia Brem LLP. Blade Bassler. BBA, Finance and Entrepreneurship, 2006. Chief operating officer of Bassler Energy Services. How did you get to UH? My father was recruited there to play football. This would have been I believe in 1970, so he went there on a football scholarship and just really fell in love with the school and with the city of Houston. As a kid growing up, my mother and father were always taking me and my two siblings to football and basketball games, all kinds of UH events. So I just kind of grew up around the university. What about your siblings? I have a sister who is two years younger than me who went to UH, for undergrad and law school. She’s an attorney here in town. And then my younger brother went to UH and played football there. … We are pretty big supporters of the program. All of us went on scholarships. I was a high jumper on the track and field team, and my sister was on the track and field team as well. What did you get out of Bauer? I really loved the entrepreneurship classes because a big part of it was verbal. How well you can give a presentation and kind of do mock trials of raising money. They teach you the ins and outs of the financial aspects of running a business, as well as the real-world entrepreneurial truth of it. So it was a good mix. The classes are taught half by academicians, and the other half of the professors are real-world entrepreneurs. It was just an incredible program, and it really kind of got me motivated. I still have a really close mentor from that program, Ken Jones, who I talk to almost daily. … A lot of the students are now some of my best customers. We kind of had this hometown thing going on. It’s a really supportive group of people — let’s put it that way. Everybody that was involved in the program, they just go out of their way to support me. Did you participate in BurgerFest (now known as Wolffest, part of the WCE capstone course and the final step in completing a BBA in Entrepreneurship at Bauer)? Absolutely. That was a lot of fun. Oh, man, we were horrible. We were horrible! … We made the program some money. We should have taken it a little more seriously than we did, though. But I tell you what, we had a lot of fun with it. What does Maw Maw think of BB’s? She’s a very proud grandmother. Every time she comes into town, she’s quick to come in and taste the gumbo. That’s the first thing she normally does. She’ll let me know if it’s not right, that’s for sure. CAN’T WAIT TO GET INTO THE PROGRAM THIS SEMESTER!! !